Isn't it great to have the smell of something wonderful baking on a weekend morning! This baked oatmeal is simple to put together and can be served as an addition to a Sunday morning brunch or just simply scoop in a bowl and enjoy with your coffee. The leftovers are terrific for re-heating during the week too! Preheat oven to 375 degrees and spray inside of an 8 or 9 inch square baking dish with cooking spray. 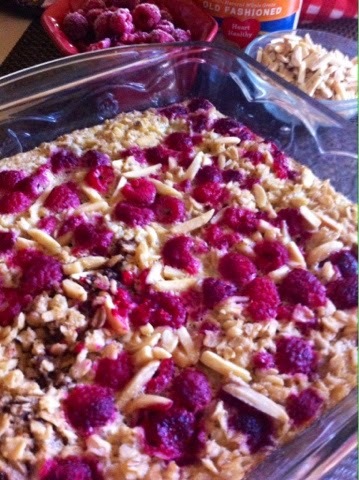 In a mixing bowl, mix together oats, sugar, baking powder, cinnamon, and 1/2 of raspberries. Spread mixture evenly in baking dish. In same bowl, whisk together the milk, egg, oil and vanilla extract. Arrange the remaining 1/2 of raspberries on top along with the slivered almonds. Pour the milk mixture over all. Bake 35 to 40 minutes until the top is golden brown and the milk mixture has set. You can serve just as is or put a spoonful of yogurt on top. If you prefer less sugar, you can reduce the amount of brown sugar. This is a wholesome and filling breakfast. Love, love the raspberries, but you can switch it out with strawberries, blueberries or bananas. This sounds good and with the oats I could say it is healthy! Absolutely it is, Haralee! Great protein and the coconut oil has even more health benefits! Also, use less sugar and I don't think you'll notice much of a difference. Give it a try! Thanks for your feedback. Oh my god. I am definitely making this on Saturday morning. I have all the ingredients, hooray! This looks amazing. I cant wait to try it. Susie, hope you try and love it too! Like the sound of your recipe. Oats are my favourite breakfast, cooked as ordinary porridge, and served with a drizzle of honey. Yes, Francene, I use honey too. Hope this one becomes one of your favorites.